I'm new to all of this so I'm trying to get my head around it all. I managed to build myself a JP1 cable which works fine with IR.exe but that's about as far as I got. My UEI remote comes up at a URC-7555 when I did a download in IR.exe I assume this is because it is the same family or something? I found the partial code using a code search that operates some features of the TV, is it possible to discover other features using brute force? Are you sure your remote is not a learning remote? Its sibling the urc-7550 has learning. If so, you could make this real easy on yourself. While the TV/0435 is a simple NEC1,0 signal yielding only 255 codes, this device could use a combo code, which would make the brute force method almost impossible. Since this does respond to NEC1 0, commands, I'd suggest you try a few of these DVD setup codes, 1115, 1316, 0831, 0770, 1173, all of which are known to work with Technika DVDs. Wow. I'm surprised that a Sky+ remote is JP1 ready out of the box! When I lived in the UK, I had a Sky and Sky+ boxes and their corresponding remotes were a bear to modify for JP1 use. If you have successfully downloaded your remote, obviously it's ready. What does your remote look like? Can you post a few pictures? Usually if it selects an rdf, then that is what should be used, but it's conceivable that a new or modified rdf might be necessary if this indeed a previously unidentified JP1 remote. I'm 99% sure it's not a learning remote because there is nothing mentioned about it in the manual and it only has an IR transmitter circuit. It's basically a Sky+ remote clone that supports a SAT and TV device. When I did a download with IR.exe it comes up with the URC-7555 which has significantly more features, however my currently programmed TV and SAT codes are correctly listed in the IR.exe tab. I tried all of the codes you mentioned but none of them were accepted by the remote (I think the remote only has codes for TV and SAT devices in it's ROM). Wow. I'm surprised that a Sky+ remote is JP1 ready out of the box! Typically if the signature is the same they have all of the same codes, but its not unusual for those codes not to be accessible through the user interface, and a cable is required. 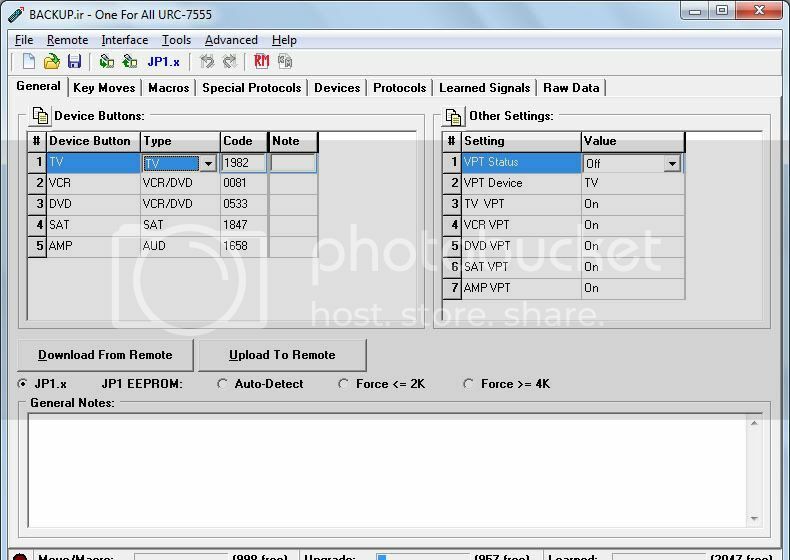 However you can check to see if the EFC's from the devices I listed work with your current TV/0435 code. 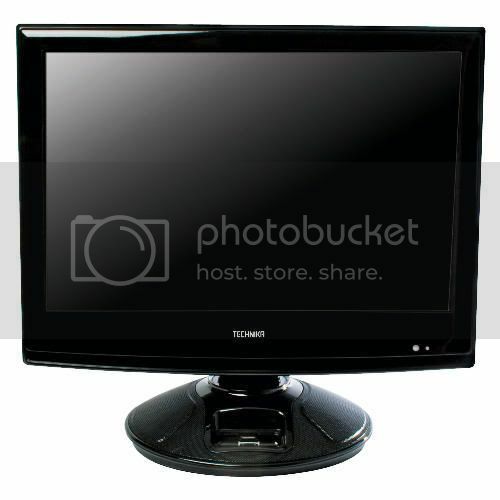 Use the Lookup tool and check out the Technika DVD players. You'll want to check out EFC's that work with NEC1 0. What would the first two digits be for the EFC code be? It is very likely that your remote has nearly the same chip as in a URC 7555/7556, because it is cheaper for the manufacturer. Also, if the ROM mask is changed, they'll put in a different signature. You can see the signature on the Raw tab, near the beginning. It will look like 31 30 37 35 31 30 37 35, which is just the hexadecimal representatom of the Ascii codes for 10751075. So, the processor is capable to support 5 devices, but the 1660 only has 2 device buttons. Unless the remote provides a way to be put into other device modes, you can't try the setup codes that Vicky suggested without using a cable. The remote has 4 device modes (internally): TV, VCR/DVD, SAT, and Audio, and a different page of setup codes for each of the device modes. Since the remote has no device button like VCR or DVD, it's not possible to enter setup codes for that page. Instead the setup codes would index into the TV or SAT page. It is probably safe to change setup codes using IR by downloading from the remote (save the file!) changing the type of the TV device button to VCR/DVD, and entering the setup code to be tested. Then upload to the remote. After testing, restore the original data to the remote. Note, however, that the RDF file isn't correct for the 1660, so don't blithely add keymoves, macros, or upgrades. If something goes wrong, you can restore the remote to factory condition by going into setup mode (two blinks) and entering 981 (4 blinks). After a 981 reset, you would need to re-enter the TV and SAT setup codes. Some good results so far, I did a brute force entry of all 256 EFC codes on the partially functional TV/0435 code I located, here are the 120 codes that work. The ones listed as ??? cause the IR Acknowledge LED on the TV to blink but do not generate any visual response, this is most likely due to the buttons only working in a certain mode which can be identified with further investigation (I was in analogue TV mode whilst testing). What would be the next step in creating an upgrade file for this remote (URC-1660)? Thanks for all your help so far, I was about to give up at one point but I'm glad I kept at it. Here is your list re-arranged in OBC order. You'll notice that the whole list repeats starting with OBC 128. Okay the next step was to put these into OBC order, like Rob did above. Now you use either RM (Remote Master) or KM (Keymaster) to input your list of possible functions. Since you wisely kept track of things that caused a reaction without necessarily doing anything, you have some good candidates for your missing keys. The next step in discovery is to check your ??? keys while you are in a mode that will accept them. Likewise you are going to want to be viewing a menu when you go hunting for your arrow keys. You should also notice that most functions are grouped together with other similar functions, the prime example being the numeric buttons that all appear together and in order. When you find the play button, for example, you will probably find that pause, rewind, etc are all next to it in the OBC list. Rob, how is the order or the list you generated determined? IE How do you know what OBC number is assigned to what EFC? You could use the EFC converter in Misc\spreasheets. But the better way is to use RM or KM. You're probably going to need these anyway to do much with your cable. For RM, on the setup page, enter NEC1 protocol, device 0. On the functions tab, locate a button name, e.g. Vol Up, and enter in the EFC you've discovered. The corresponding OBC will be filled in for you. Clicking on column headers will sort the entries (assuming more than one EFC is entered). Get RM from the sticky in the Software forum. Robert, KM or RM will compute the OBC's from the EFC's. OBC's are the "make sense" numbers. As Rob pointed out, OBC's are often grouped together by function. Although sometimes that grouping is not something that makes sense to me.